A 152% increase in second grade students reading on sight word grade level. The average increase of second graders reading on sight word grade level across all 21 schools was 301%! An average gain of 248 words, which translates to almost 2 ½ grade levels in sight word fluency. An average gain of 310 words for students at Treadwell Elementary, ARISE2Read’s pilot school. This equates to 3 grade levels of growth in sight word fluency. Partnerships with 28 churches, 4 businesses, and 2 non-profits to support students in a total of 34 schools. “Increasing sight word recognition is a critical foundational skill for our students to master,” said Karen Vogelsang, Executive Director of ARISE2Read. “When our students can recognize sight words with mastery, their brains are freed up to focus on comprehending what they’re reading.” This year’s data is especially encouraging when you consider that most of the schools served are categorized as “critical focus” schools. In fact, 13 of the schools that ARISE2Read served in this year had 5 or less students reading on grade level at the beginning of the year. Pre-test results indicated that only 21% of second graders in ARISE2Read schools were reading on sight word grade level. 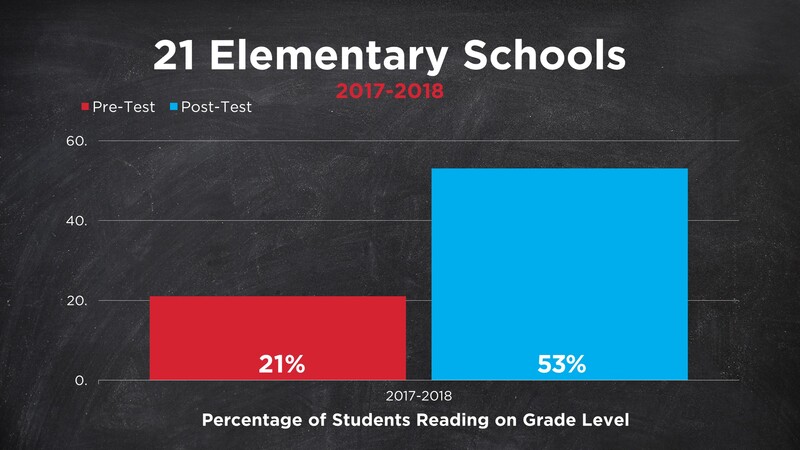 Post-test results revealed that 53% of second graders were reading on sight word grade level, which represents a 152% increase. ARISE2Read’s testing data represents over 800 students in 21 schools who were coached for one hour a week in both semesters. Increasing sight word recognition is a critical foundational skill for our students to master. When our students can recognize sight words with mastery, their brains are freed up to focus on comprehending what they’re reading. ARISE2Read mobilized close to 900 volunteers to provide weekly coaching to second graders. Students also received new books at Thanksgiving and Christmas. Earlier this month, ARISE2Read students celebrated their accomplishments during Camp Read S’More parties, where they each received a backpack with six brand new books, a summer reading packet, and other reading goodies. ARISE2Read intentionally provided six books for each student since research shows that a child who reads as few as six books over the summer will maintain their reading skills at a level achieved in the preceding school year. As ARISE2Read continues to expand into more schools for the 2018-19 year, an additional 500-600 volunteers will be needed. Donna Gaines, founder of ARISE2Read said, “The children of our city are our children. We cannot stand by and not be involved. We must work together to Save a child. Save a family. Save a city.” To get involved with ARISE2Read next year, make plans to attend the annual Fall Kick-Off and Training on August 7, 2018 at Bellevue Baptist Church. To learn more, click here!